This walk: 2013-6-5. Sourton Tors, marker stones, King Way, SWW water works, ice works, Meldon Reservoir, boundary ditch, apple crusher, Pixies' matchsticks, Meldon dam, Shelstone Tor, luggage "handle" on a large rock, non-logan stone, Vellake valley, Greep Quarry. Link to Google Satellite view of the area - the car park is in the upper left area, on the track up to the water works. 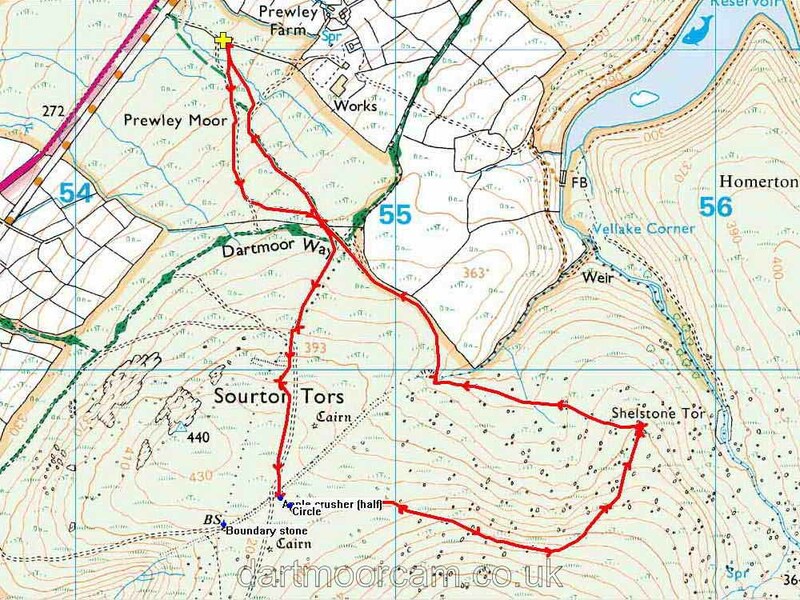 Heading towards Sourton Tors, SX 543 898, elevation 440 metres (1443 feet). As previous photograph, with a possible tinners' trial pit in the foreground. Two posts marking the King Way, this was a fast mail delivery route for several hundred years, using high, dry ground from the Exeter direction towards the west. South West Water's Prewley Water Works, at SX 548 908. Showing two of five reservoirs of the Sourton Ice Works, 3-feet deep, lined with bricks or concrete. These are on a cold, north-facing slope, fed by a spring, where winter weather was meant to freeze the water. Ice was largely used by fishmongers and was removed by horse and cart, some to Bridestowe Station for train transport to London and South western Railway. The entrepreneur was James Henderson, a successful civil engineer, respected in mining circles. The venture lasted from about 1875 until about 1885 (Hemery, page 932). Google Earth view of the ice works. The right-most reservoir seen in the preceding photograph, with Sourton Tors in the background. Zoomed view to Meldon Reservoir. Another view along an ice reservoir, showing it curving along the contour. Locally, there were known as the ice pits. 32-metre diameter stone circle, SX 54672 89578. There are 18 stones, 5.5 metres apart, all flat but mostly with one edge still embedded in the ground. Click on the image to see a larger version. Possibly the red tipped fruiting bodies of Cladonia floerkeana, known locally as Dartmoor matchsticks, pixies' matchsticks or as devil's matches - this species is very like a matchstick. Alternatives would be C. diversa (fruiting stalk is branched), C. macilenta (red tip is very narrow compared to diameter of the stalk) and Dibaeis basomyces (fruiting bodies are short and fat). Several Cladonia species can be seen here. It is possible that a fruiting stalk upper left of centre is branched. A video panning from Corn Ridge, to the right, showing Sourton Tors (zooming closer), looking down to Shelstone Tor (with Homerton and Longstone Hills behind), zooming towards Yes Tor at the end. Casual view of the walking group. After "three" we'll jump again! Rock pile at Shelstone Tor, note the inclination of the bedding planes? Shilstone Tor, with Yes Tor (with military firing range flag pole) behind. Looking down Vellake, a quite dramatic re-entrant valley. Greep Quarry, at SX 551 899, that yielded slatey border rock that was used in Sourton village, in the Victorian vicarage and the Wesleyan chapel. The stone was removed by cart track to the village. This walk was reached via the main A386 Tavistock-Okehampton road, turning off at the brown "Granite Way" sign shortly after leaving Sourton while travelling towards Okehampton. Parking is at the yellow cross symbol on the map. Distance - 5.53 km / 3.44 miles.